Heylo! It's been a whole week! I hope you all enjoyed my two lovely guest bloggers - they were great, huh?! I've really missed this whole blogging thing, though. ;) This past week was the definition of stressful, so it's good I took a break and concentrated on school. The gist of it, is that I had my junior research paper first draft due on Friday, and two tests the same day. It was pretty crazy. However, now I've returned! And I have no school this week! Apparently it's something like mid-winter break/ski-week? I feel like it was just winter break. Not that I'm complaining or anything...! I plan on posting as frequently as I can this week, because I've been feeling a bit unhappy with my two-posts-a-week thing I'd been doing. I wish I could do posts daily like all the cool kids. :( Just kidding. Well, sorta. My weekend has already been pretty brilliant. I went to Goodwill with Jessica yesterday, as they were having a 50% off everything sale, so let's just say I scored pretty well. 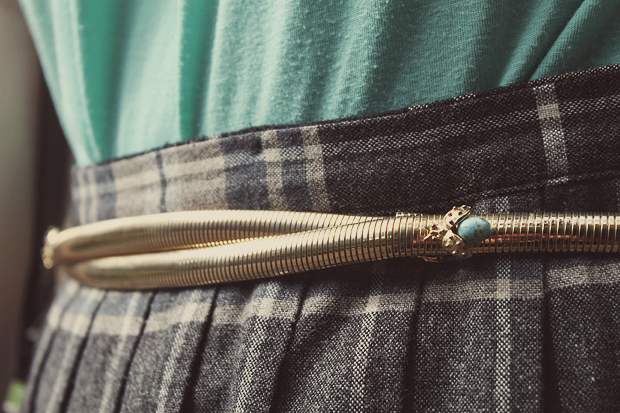 :) For instance, the boots and this stunning belt! After Goodwilling, we watched Flight of the Conchords. One of the funniest shows/bands ever. Do you know about them?! If not - look them up right now! i love this outfit! and new radiohead album- amazing!! Okay, the way that little stone on your belt matches your shirt is pretty incredible. I can't believe you weren't cold in your t-shirt... it's pretty darn chilly here in Palo Alto! And I freakin LOVE Flight of the Conchords. I was watching the David Bowie episode after watching Labyrinth. "This is Bowie to Bowie!" 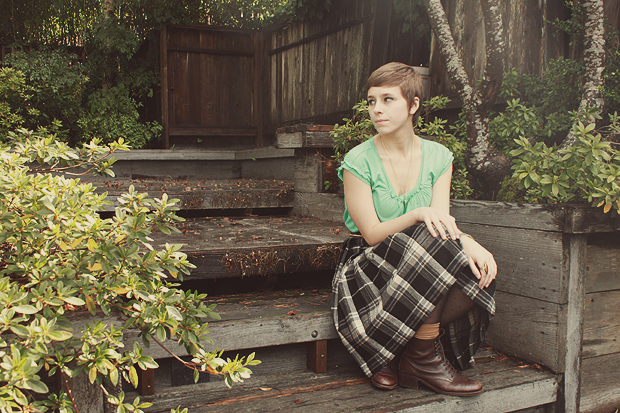 I want to rock a pixie soon. OMG I totally love your post! what a great style....I want your haircut! you look fabulous and it's so good to have you back :)! I hope you enjoy your mini vacation :D how awesome! Welcome back! I'm glad you were able to focus on school during your blog break. That belt is perfect! I usually do pretty well in the accessories department when thrifting too. Dude, I love Flight of the Conchords! I have the first season on dvd. My cheeks and stomach usually hurt when watching the show! Those boots are truly wonderful as is that skirt! I'm loving this outfit. And welcome back to the blogging world! I have never been able to take a break and genuinely leave the internet...it's so addicting, ha. Great belt! OMG I love your ring too. Fab! Good to hear you're getting a break after all that Friday excitement :) Christmas break seems like it was years ago to me.. Have a great week! you are too cute! those tights and that skirt... FANTASTIC girl!!! your outfit is delicate and romantic to me! so very nice. You look amazing! 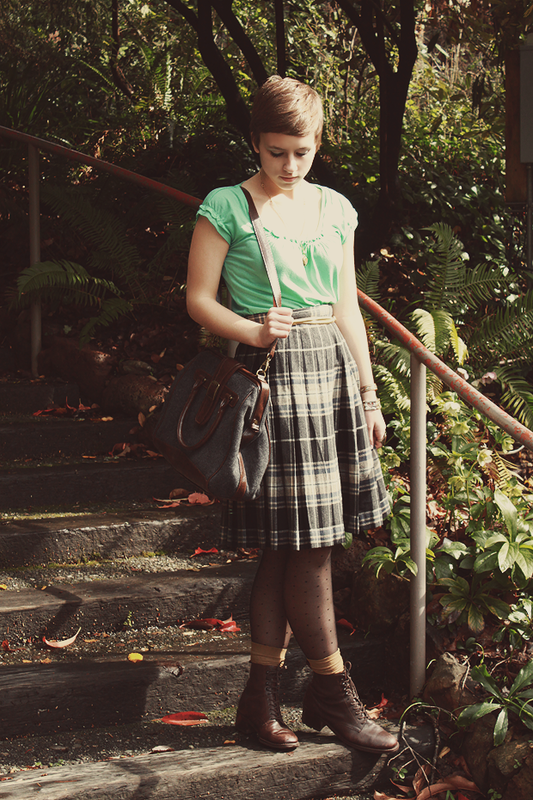 I'm loving the skirt. And I don't understand, you seriously score the greatest finds! 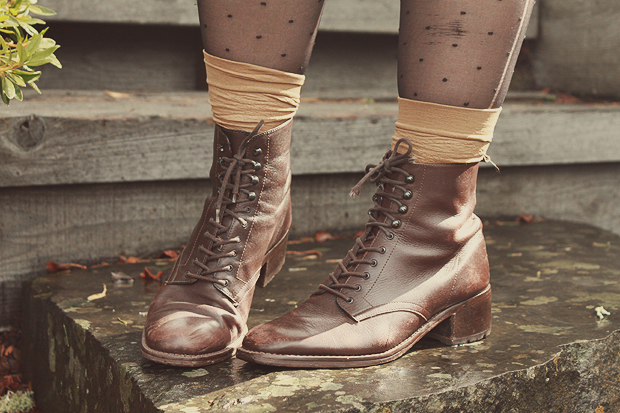 I'm never able to find anything like those amazing boots at Goodwill. Love Flight of the Conchords! This outfit is so beautiful! Your accessories are wonderful! I feel like I've told you this before, but I LOVE your haircut. It's super cute on you! I adore this outfit! 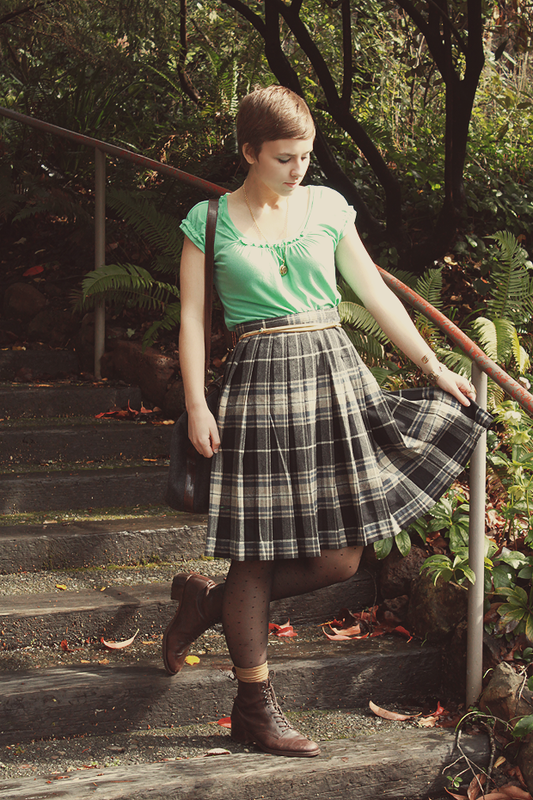 It works so well together (and I really want your skirt). Aww. I agree with Jenny, I just adore this outfit. The boots were a fantastic find!! Lucky lady. 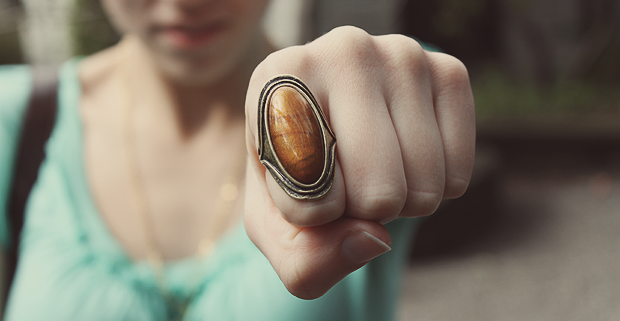 thats such a special ring!! PS love the belt + lace up booties, what great finds! 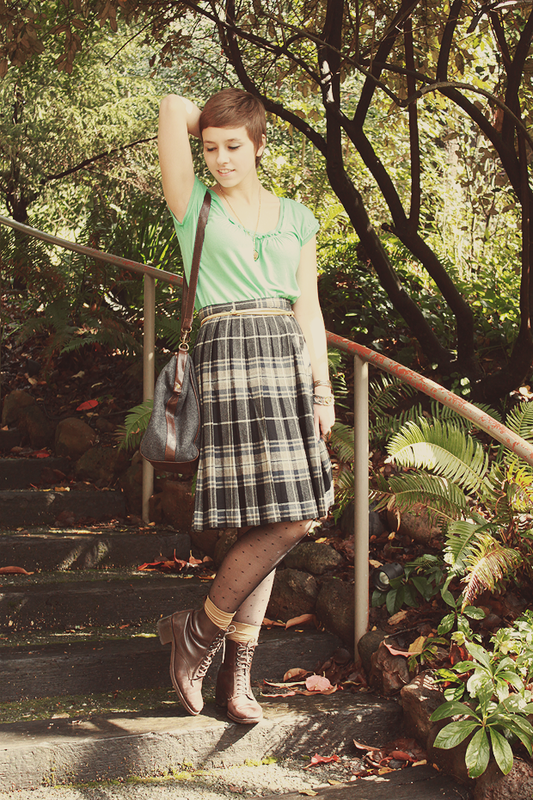 Love your skirt, and that belt is so cool! I love Flight of the Conchords, my boyfriend and I watch it a lot. He's always hoping they'll come back and do another season. One of my favorite parts of the show is Bret's wardrobe, it seems like he's always wearing a sweatshirt with a wolf or something on it.